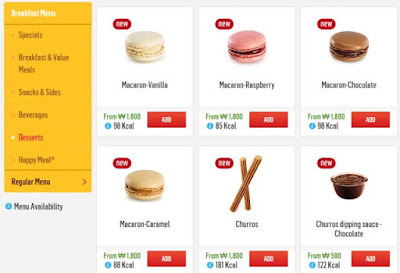 McDonald's South Korea's is serving up new Macarons and they can be delivered straight to customers' doorsteps via the company's McDelivery service. The Macarons are made in France by Chateau Blanc and come in four flavors: Vanilla, Raspberry, Chocolate, Caramel. They go for 1800 won a piece (~$1.45) on the delivery service. Add to the fact that you can also order cappuccinos and espressos for delivery and you have a very convenient afternoon break right there. If you happen to be in South Korea, just know that the minimum delivery order 8000 won (~$6.43) or about five Macarons (or churros! ).